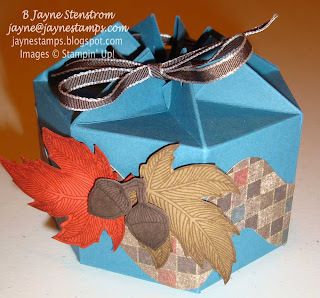 ~ ~ ~Jayne Stamps ~ ~ ~: What to do with a suddenly free night? Monday night we were supposed to have a meeting at my upline's, but due to unforeseen circumstances, it had to be postponed. So here I had a whole night available with nothing else planned. So what did I do? I called the girls who usually go to the meeting with me and asked them if they wanted to come over and stamp! Everyone thought that was a good idea, so we gathered here and did some creating. Convention is a great place to get ideas on how to "think outside the box" - literally in this case! 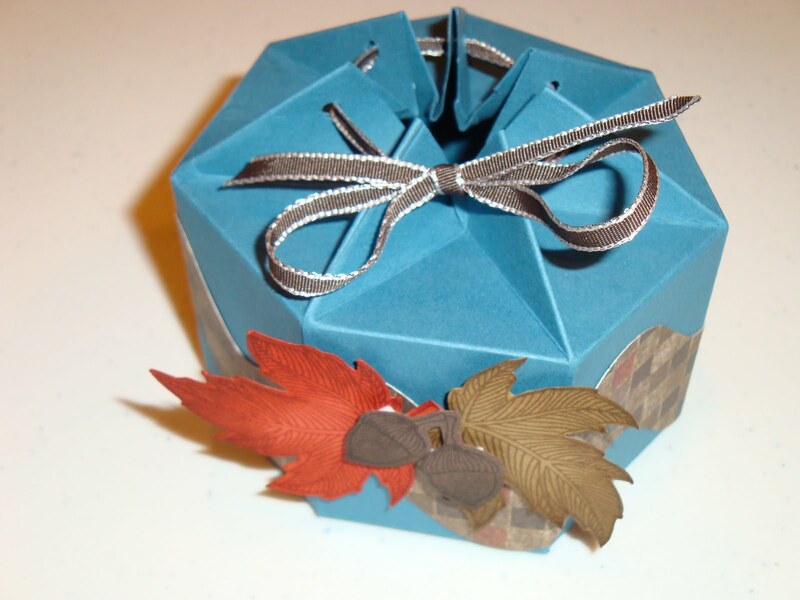 This seven-sided box is made from the Mini Milk Carton Bigz L Die! Mine is made with Not Quite Navy cardstock, Well Worn DSP, Tasteful Trim Bigz XL Die, Autumn Splendor stamp set, Cajun Craze, Soft Suede, and Early Espresso cardstock and dye ink pads, 1/8" Early Espresso Taffeta Ribbon, and Stampin' Dimensionals. Here is a view from the top. Can you tell I'm getting in the mood for fall? It took us a little while to get the hang of putting the box together, but once we did it, it wasn't that hard at all. Then we all made a card using a technique that's been around for quite awhile, but one that I haven't done for a few years. It's called "Poppin' Pastels". 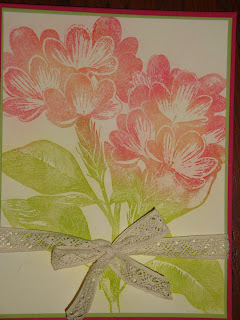 We took the Sweet Floral stamp and inked it up with VersaMark ink, then stamped it onto Very Vanilla cardstock. We took our Stampin' Pastels and Sponge Daubers and pounced the color on top of the stamped image, using about three colors of pinks to get some of the graduated shading seen, and a couple of shades of green. That makes it look more realistic with variations in the colors. I then layered the image onto a piece of Certainly Celery cardstock, tied some Chantilly 1/2" Crochet Trim around the bottom, and finished it off by putting it on the front of some Rose Red cardstock. I love how this looks! Everybody's finished product looked a little different depending on how much of which color they used. I want to make another one using shades of purples. Any other color combinations you think would look good? How about shades of yellows? That would have more of a "fall" feel to it. I CASE-d this card from Patty Bennett's blog. She always has such great ideas!